Wooden Spice Box with 9 Segments. Keeping the never ending demands of customers in mind, our company offers standard quality range of Wooden Spice Box. This Wooden Spice Box is known for its attractive look and beautiful patterns. Our product range is widely demanded in both residential and commercial kitchens. Dimension: 6 x 4 "
Fine Decorative Wooden Spice Box Available In Different Designs & Sizes. We are one of the Leading Manufacturers of Wooden Spice Box. We are leading manufacturer and supplier of sheesham Wooden Carved Spice Box. We have marked a dynamic position in the market by providing the finest quality range of Wooden Spice Box. "With the right kind of spice, every meal is nice! Keep all of your spices ready to go in this handcrafted bird spice box. 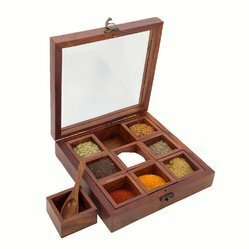 This spice box is crafted in Mango Wood with 4 compartments. This box is perfect to use for any kitchen spices. Organize, simplify and enjoy cooking in your kitchen. 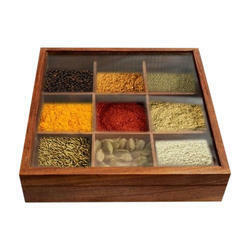 Wooden Spice Box is used to store spices and it is perfect for your kitchen accessories.